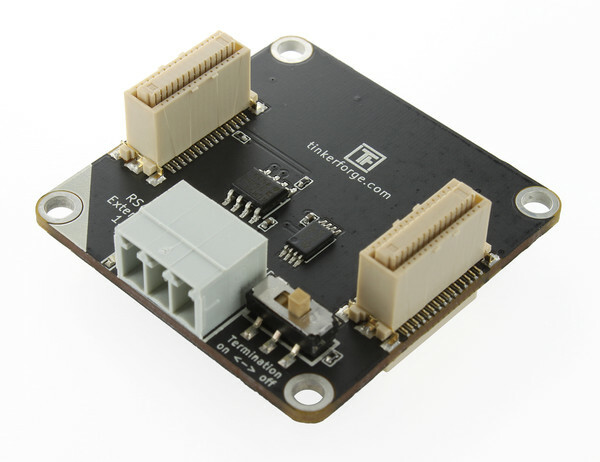 The RS485 Extension is now available. After a lot of back and forth (we changed the protocol two times) the RS485 Extension now uses Modbus RTU as the protocol on the RS485 interface. This isn’t the most efficient protocol for our data packages, but Modbus is widely used in home automation and industry. There are e.g. gateways that can transform between Modbus and TCP/IP. Thus it is now possible to use the RS485 Extension in an existing Modbus network. It is also possible to communicate directly with RS485 stack via Modbus, similar as it is already possible with TCP/IP (documentation for this is still work in progress). For this we added the option to configure the baud rate, parity and stop bits. The default configuration has a baud rate of 2Mbit. This is faster than the USB 1.1 connection, therefore the RS485 bus won’t be a bottleneck in your system! If you have a big RS485 bus and you get timeouts and the CRC error counter is rising rapidly, you should try to decrease the baud rate. To make the installation of many small RS485 stacks as easy as possible, we added a USB Power Supply to our shop. This power supply can’t be used to operate motors (DC, Stepper, Servo), but it is perfectly suitable for small RS485 slave stacks! We released a new Brick Viewer version. With the new version it is possible to not only flash Bricklets, but also Bricks. This is now done automatically from our server, there is no need to download a suitable firmware by hand. This means that SAM-BA as a third-party tool is not required anymore. It seemed that the Atmel tool made lots of trouble and there was no Mac OS X version. Furthermore we reimplemented some stuff to reduce dependencies. The Brick Viewer now doesn’t depend on pylab, scipy and matplotlib anymore, this should make the installation on embedded devices and small Linux distributions quite a bit easier.